Apple's latest version of watchOS promises to bring rich HTML content to the wrists of Apple Watch users, thanks to new Webkit optimizations that improve apps like Mail and Messages. 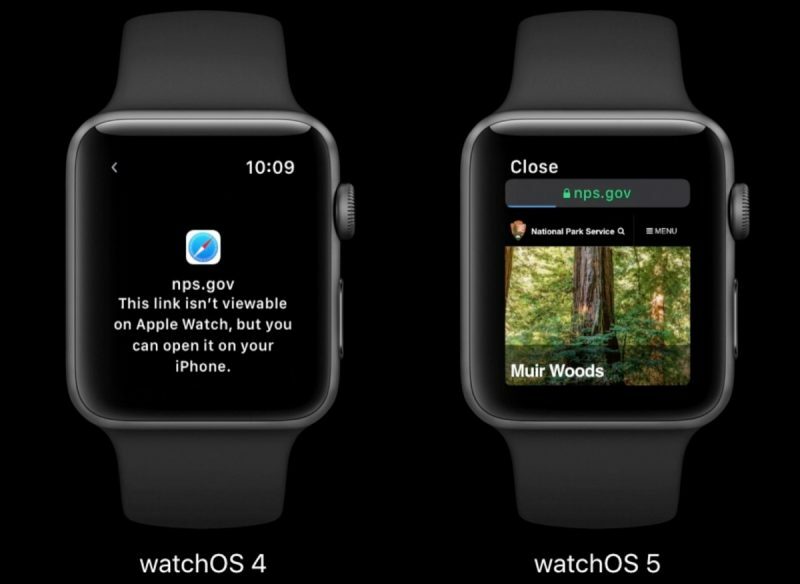 However, in watchOS 5, full HTML emails are capable of being displayed on Apple Watch in cases where text-only formatting can't express the content of the message, and users can also view web page links, as well as interact with them, albeit in a limited way. Apple notes that the optimizations are aimed at quickly consuming content, so some features like video playback and web fonts aren't currently available. However, users will be able to interact with forms within HTML content, and there's also an Safari-like Reader mode, which automatically activates on text-heavy web pages (the Reader Mode option is also accessible via Force Touch, so users can choose to read pages on their watch with extraneous content stripped out). I get the sense that Apple still doesn’t know what they’re doing with the Apple Watch and they’re just throwing ideas at it and seeing what sticks. I have this justifiable feeling my Series 1 is going to be dog slow when this rolls around in September. They must be doing something right, with its popularity. However, Can you elaborate on this? I mean it’s rather vague what you’re saying. In terms of where watchOS once was and where it is now, how is it “They don’t what they’re doing”? I also think anytime Apple introduces something new, it must have some type of acceptance in order for it to be useful to somebody. I’m not sure how others don’t expect software to expand if they don’t try new things. Am I the only one that thinks the screen is way too damn small to read an article on a holiday destination as demonstrated? I just think it’d look really dumb and feel really dumb if you were squinting at this tiny little screen scrolling thru an article. Just pull out your phone it’d be so much quicker!!. We know the iPhone would serve a different purpose for a larger display, but Apple Watch is nice because you don’t have to have your iPhone with you all the time to glance at the display to see something and then revert to the iPhone if you want to. OtherWise, it sounds like the Apple Watch isn’t really for you based on your concerns over a small screen, given its alternative functionality. Can I, as a web developer, set a 156px media query breakpoint to target the Apple Watch specifically or is this an automatically scaling only thing with no way to override it? I can't even test the beta on my Series 0 and won't upgrade until the Series 4 this autumn. I kind of want to be cheeky and put up a fixed position overlay that says in white on black background: NO. But in all seriousness though, I feel like some of my designs are robust enough that I could scale the text size up and make it a little more usable with a simple media query. I've often been frustrated when my wife sends me a link to something on my Watch and I can't just tap it to see what it's about really quick. It would be neat if when opening a link you could force touch and bring up a button to send a reminder to your iPhone lock screen that, when tapped, will open up the webpage on the device whenever you get around to it. I disagree. Apple has dramatically improved the Watch far beyond what we saw with the first generation. That being said, displaying HTML and web content on a tiny display is not a critical feature. The Watch excels in several different ways, and I’d rather not see Apple stretch certain features beyond its capabilities. If this destroys the battery life or throttles the performance, the juice isn’t worth the squeeze. I hope this is a toggle. Doesn't Mail app by default (macOS) not load external content unless you click the link to "Download all images"? I cna't help but think that "nasties" could be loaded to the watch via this rich HTML view. Just pull out your phone it’d be so much quicker!! I can barely read a text on mine, I just see oh cool I have a notification and pull out my phone. I cna't help but think that "nasties" could be loaded to the phone via this rich HTML view. Is that not all computers tho? I’d feel safest on an Apple smart device rather than an android or windows based computer. I’m pretty excited to see this myself. I think most of my emails contain HTML and while o don’t want a full desktop experience, right now those emails are impossible to check on the Watch. If this can at least make the more simple ones readable I think it’ll be a great update. People said the same thing about watching video on a phone 10 years ago. Here on MR people are often vocal about wanting to have options with Apple products. Being (soon) able to display web pages on the Watch is an option (and it could become an interesting one) - nothing more, nothing less. Besides, perhaps Apple already has a plan within a bigger picture, which could benefit from this functionality in the future. A future AppleWatch will replace the iPhone as central unit for lightweight tasks, using AR glasses as display and voice&gestures for interaction.